Let me first say to you, Senator Heitkamp, as the father of two wonderful women and the grandfather of a little girl too young to have learned that the adjudication of her rights has just been placed into the hands of a sexual predator, thanks! You have had the courage to speak up for vulnerable women in a very frightening time. I know whereof I speak. On the night of the 2016 election, two male Babson College students drove through Wellesley College in a pickup waving a Trump flag and uttering racist and sexist epitaphs at all who happened to be on the campus of that all women’s college. I first heard of this, not from any media outlet, but from my eldest daughter, an alumnus of that fine institution, who was present that night for an election watch party. The message was clear. The man who brags of grabbing women by the privates is in control. Girls beware. From here on out, it’s a man’s country. Today the Senate (principally its GOP members) affirmed the sentiments of these young men by confirming Brett Kavanaugh’s nomination to the Supreme Court and letting our women and girls know that, if they are sexually abused, best keep quiet. You won’t be believed. You will not be heard. This is a country of men, by men and for men. On this dark day, your courageous voice and vote constituted a clear and decisive witness and reminder that our country is better than all of this. I know that you are paying a heavy political price for the stand you have taken. I wish that I could give you my vote, but as a resident of Massachusetts, I obviously cannot do that. All I have to offer is my sincere gratitude and prayers for your ongoing work. I have no doubt that your public service and your contributions to our country will remain and continue, regardless of election results. That you were willing to put the well being of the women and girls I love ahead of your own political self interest speaks volumes about your character. I wish there were more persons like yourself in politics who place principle over polls, conscience over convenience and country over party. Thank you for demonstrating to my daughters, my granddaughter and the many women I care for that they have a voice and that they matter. Thank you for standing up for the hundreds of victims of abuse whose lives have touched mine throughout my years of ministry. You are a true hero. Now, Senator Collins, I turn to you. How poorly your capitulation compares with the courage demonstrated by your colleague! How very poorly you compare with Dr. Blasey Ford who, in the face of outrageous abuse, including death threats to her and her family, came forward to testify before the entire nation about the most intimate and humiliating details of a most horrific trauma. Dr. Ford put her life on the line for her country. Senator Heitkamp put the rights of women and the safety of our girls ahead of her political career. You scampered into the shadow of Donald Trump to save your political hide. Your high sounding rhetoric about protecting women’s reproductive rights and overcoming partisan divisiveness over the years has won you a reputation for wisdom, understanding and moderation. But today you voted to put on the Supreme Court a man who, according to the sworn testimony of Dr. Ford that even your Republican colleagues deemed credible, committed a violent act of sexual assault. That tells us who you really are and puts the lie to your professed concern about sexual assault and sympathy for the “Me too” movement. Almost as revolting as your vote in the face of Dr. Ford’s sworn testimony was the lame explanation you gave for it. I don’t think for one minute that you really believe the “presumption of innocence” governing criminal proceedings has any application to what is, after all, a job interview. I certainly would not hire Judge Kavanaugh to babysit my children after hearing what Dr. Ford had to say and I doubt that any other parent would either. Yet you seem to think we can overlook these serous allegations of sexual assault and put this man on the Supreme Court out of “fairness.” I was honestly embarrassed for you and I think you were also more than a little embarrassed yourself. I suspect your real target audience was a president and his supporters who think men are the real victims and that “the girls are doing just fine.” How sad that a woman of your accomplishments and intelligence would stoop to groveling before a man who thinks it’s funny to ridicule a woman trying to piece together what happened to her in the wake of a sexual assault. Yet, like the rest of your Republican colleagues, when push comes to shove, you play to the base. Whatever it takes to get re-elected is fair play. Furthermore, even if we accept your rejection of Dr. Ford’s testimony as a “false memory,” even if we accept the outlandish assertions of some of your Republican colleagues that the other two women reporting sexual assaults by Brett Kavanaugh were only doing so to “get attention,” and even if we were able to listen with a straight face to Judge Kavanaugh’s highly improbable excuses for his explicit and obscene yearbook messages, you and all the rest of the country heard Brett Kavanaugh rave incoherently about conspiracies against him by the Democrats and the Clintons. You cannot convince me that you didn’t see at least clear and convincing evidence of an emotionally unstable and dangerously unhinged mind clearly lacking the temperament for any judicial post, let alone the highest court in the land. But, when the Donald calls, neither judicial character nor the safety of women and girls must be allowed to “Trump” the party line. I must say, you had me fooled. I truly expected better of you and so did the millions of American women you betrayed. I am convinced that history will not look kindly upon you. You will be remembered, if at all, as a handmaiden to the most corrupt, vile and incompetent president this country has ever seen. You will take your place along with the now embarrassed supporters of George Wallace, Lester Maddox and Strom Thurman, champions of ideologies no less hateful than the systemic hierarchical oppression of women, a system that facilitates the victimization of women like Dr. Ford and summarily silences them. Because I believe in the true greatness of our nation’s core values, I am confident that the Trump regime, its supporters and those, like yourself, who submitted to it for their own political advantage will find their way into the dust bin of history. But history will not be your harshest critic. You see, Senator Collins, I know that you are not an evil person. You are simply a person who never found the courage to be good. I believe that you possess a conscience. For that reason, you will forever be re-playing over and over again in your head like a broken record the reasons you gave for supporting Brett Kavanaugh, trying in vain to convince your skeptical conscience that they are all legitimate, that you were right all along, that you cannot be blamed for the consequences of your complicity in what you must know even now to be a travesty. You will wake up every morning in the skin of a coward and know that there is nothing you can do anymore to shed it. Every time you look into the mirror you will be confronted with a traitor. 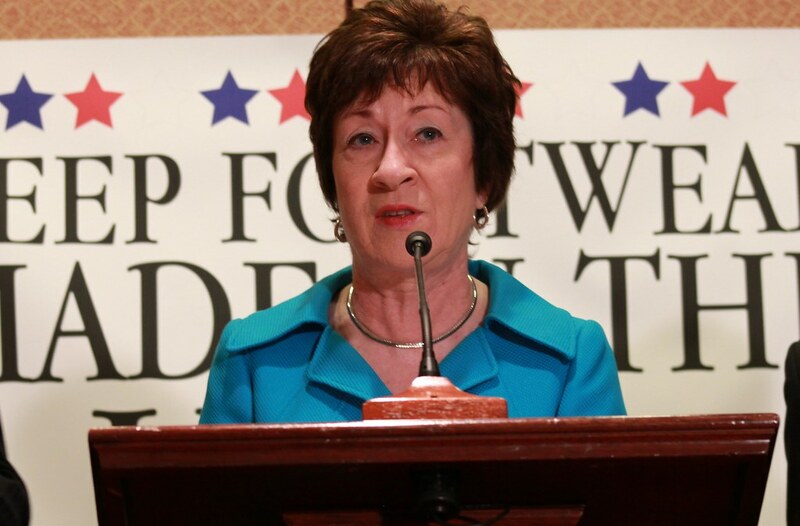 For that reason, Senator Collins, I pity you. I will pray for you also. I will pray that you someday find the courage to confront the truth about yourself and what you have done. I will pray that you someday find the path to redemption for the remainder of your life and know some measure of peace.